THEY improv's The Grapes of Laugh is set to become a leader in entertainment options for wineries, vineyards and tasting rooms around the country. With improv comedy, game shows, murder mysteries, team building and characters, THEY can handle just about anything that you need for your corporate or family entertainment. Let us know where you would like an event, the size of your group and when you would like the event to be. We can then get you options and pricing. locations. After all, these were far different than those for our normal Fortune 500 clientele. 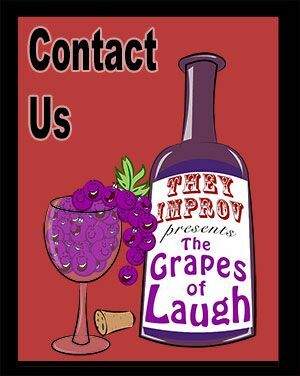 Call 866-219-4386 or email us at info@grapesoflaugh.com.